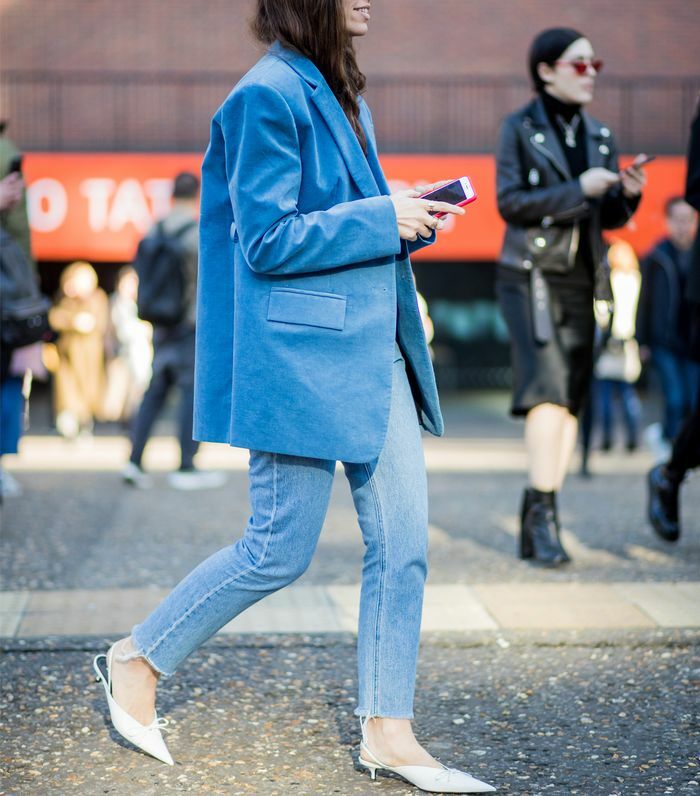 If you’ve been keeping an eye on the style set lately, you’ll know that there’s one noticeable outfit that's made its way back into the spotlight as of late: the blazer-and-jeans combo. Now, you could argue that it never really went away—after all, it requires minimal thinking, styling-wise—but this go-to look shows no sign of slowing, and we're celebrating by sharing some new outfit inspiration just in time for spring. So what’s new? For starters, designers have moved on from traditional grey checked blazers; now we’re seeing vivid shades, punchy plaids and classic corduroy in their place. For denim, it seems that loose-fit, high-rise styles perfectly compliment those tailored separates. Sound good? Scroll below to see (and shop) six new ways to wear blazers and jeans this week. Style Notes: As we head into spring, we’re leaving behind all those dark moody hues and welcoming colourful, new-season buys into our wardrobes. Starting with blazers. Choose pastels—think powder blue, yellow, pink or lilac—and match up with straight-leg, high-rise jeans to let your statement separate take centre stage. Style Notes: Heritage checks will always look super-chic when teamed with boyfriend jeans, and it’s one of the easiest and simplest to wear. The good news? You've probably already got a hero checked blazer to hand. If not, try Joseph for subtle pops of colour, and finish with a pair of & Other Stories loose-fit jeans and kitten heels. 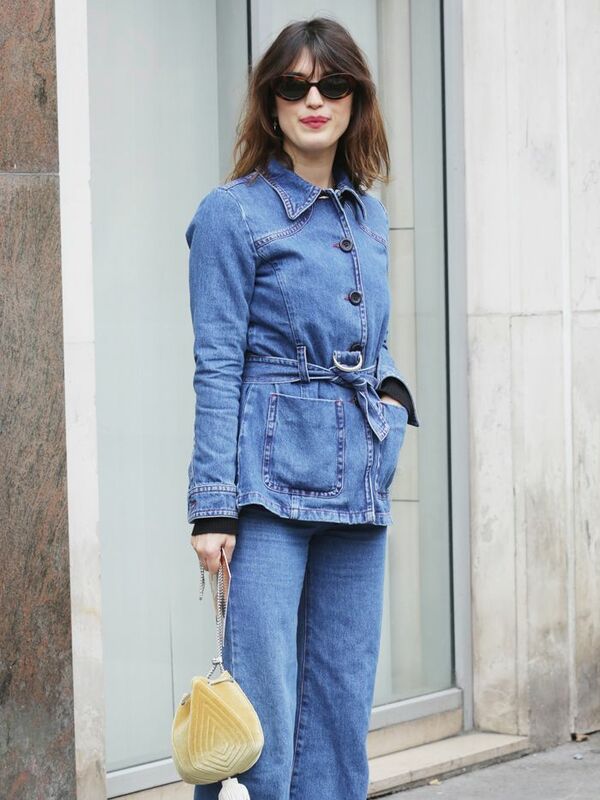 Style Notes: We can always rely on Lucy Williams to provide easy off-duty outfit inspo. Re-create this look by taking one corduroy blazer, a basic white tee and finish with ripped jeans and cat-eye sunnies. So chic. Style Notes: If you're in the market for something bold, go for a punchy plaid blazer. Sound scary? Pernille Teisbaek proves just how easy it is to wear. Go tonal and match with a checked shirt, like Pernille, or keep it simple and style with dark wash denim. Style Notes: There's a reason the fashion crowd still relies on the black blazer–and–blue jean combo: It's so chic and so easy to update with a few new-season add-ons. Wear yours with a printed neck scarf, or why not try a block heel pump like Camille? Either way, it always pays to have this classic pairing to hand. Style Notes: If loose-fit, masculine tailoring isn't your thing, look to Jeanne Damas, seen here in a flattering, form-fitting neutral blazer with cropped, wide-leg jeans and heels.